What do we offer today? Steampunk with all of its wild creations and two main characters to keep readers involved. Welcome to our stop on the Lumière blog tour. Make sure to enter the cool giveaway. Have a great weekend! Even in a land of eternal twilight, secrets can’t stay hidden forever. Alone and on the run, she finds the Illuminator—only to witness a young man hauling it away. Determined to follow the thief and recover the machine, she ventures into the deepest, darkest, most dangerous part of her twisted world. 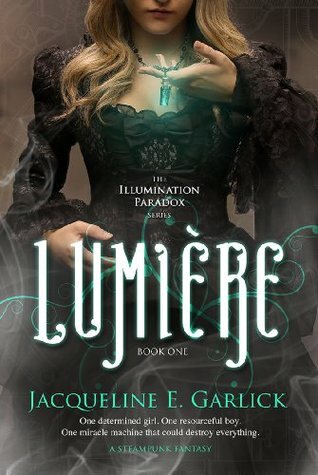 Lumière by Jacqueline Garlick offers readers a fascinating world filled with strange fantastical characters, creatures, and places. Main character Eyelet (cool name) is the daughter of a mysterious inventor and secretive employee of the government who we see through her flashbacks. Her mother we meet briefly in the prologue and in a small scene afterwards, but for the most part Eyelet, 17, is on her own. She attends an interesting school and she is determined to learn more about and find her father's invention, the Illuminator. She meets a stranger, Urlick, by chance during a frenzied escape scene when she sees him steal her father's contraption and sets off to accompany him on his trip. Eyelet is smart and can be resourceful and like a cat, she is mighty curious, a trait which gets her into oddball situations. What she discovers at Urlick's home reminds me of something straight out of a Tim Burton movie. He's an inventor of steampunk-ish machinery of which he names and talks to. As I read his narrated scenes I kept thinking of him as a cross between Doc from Back to the Future and Dr. Frankenstein. He's a loner, mostly because he's sensitive about his discolored face, and seeks to help out those shunned by society. Having a beautiful girl like Eyelet in his home creates some conflict within himself since he is attracted to her but knows a girl like her wouldn't want someone like him. Little does he know that while he keeps his secrets, so does she. Eyelet suffers from the Madness society runs from, locking away some and horribly punishing others by waxy death. These two main characters and the world they inhabit is certainly intriguing. Seeing Urlick's weird creations and meeting the various guests in his home fed my increasing curiosity and once Eyelet finds that map in the study I knew I had to finish reading in order to satisfy my appetite for this story. Their relationship made me laugh at times and growl at others. They are such an odd couple and that's what makes them so appealing. The one comment I will make pertains to the worldbuilding and flow of the story. There were moments when I did feel frustrated, wanting to know more about the world or its creatures as a scene and situation unfurled. Instead of being thrust into it, I would've appreciated being eased into or a build up to help me better visualize things as they played out. When Eyelet escapes her school I had to re-read sections to fully comprehend this rich, new world and all of its wild, frenzied magical goings-on. Steampunk worlds always intrigue me when done right and despite my earlier comments I thought the author established a wholly creative and unique foundation for this series. Garlick has quite the imagination! From the mystique of the Vapors, to Pan and Urlick's various creations (that breathing cycle was very cool), I could continue with the list of things which fascinated me (Eyelet's necklace too). Eyelet and Urlick's story kept me invested in the curious, highly imaginative world and society created by author Jacqueline Garlick. I will also mention the engaging secondary characters as well. There's much to like and be entertained by here. Consider me a fan. I love to read, write, paint (walls and paper). I have a love/hate relationship with chocolate, grammar, and technology and would rather hang out with a dog, than a cat. I prefer creating things to cleaning things, and believe laughter is a one-stop-shop solution to all that ails you. You will always find a purple wall (or two) in my house (currently in my writing room), and there may or may not be a hidden passageway that leads to a mystery room. (Okay, so you won't find a hidden passageway, but a girl can dream, can't she?) Oh, and tea. There will always be tea. My writing style has been described as edgy and rule-breaking, and by some--a touch Tim Burton-esque. Because of this, I am often referred to as the Quentin Tarantino of YA among writing friends. In my former life, I was a teacher (both grade school and college-don't ask), but more recently I've been a graduate of Ellen Hopkin's Nevada Mentor Program and a student of James Scott Bell, Christopher Vogler and Don Maass. An excerpt from Lumière earned me the 2012 Don Maass Break Out Novel Intensive Scholarship. Lumière--A Romantic Steampunk Fantasy--my debut novel, is the recipient of an indieBRAG Medallion!!! B.R.A.G. Medallion Honoree October 15, 2014) I am so proud! (LUMIERE by Jacqueline E. Garlick is a B.R.A.G.Medallion Honoree. This tells a reader that this book is well worth their time and money!) Book II of the ILLUMINATION PARADOX SERIES, is out January 26th, now on pre-order. 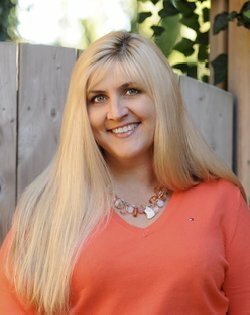 I'm open to reviews and interview, requests for skype visits, guest blogs, pod casts and book club meetings! I LOVE TO HEAR FROM READERS! There is a tour-wide giveaway (US/CAN) of a special PPP up hand cut flying balloon card, signed copy of Lumiere and some bling (see image). This giveaway ends Nov 19th. Great review, Laurie! This sounds like a great read - and I love Tim Burton movies they're so strange and eerie! So this sounds right up my alley! Lol! I find you can make such unique worlds/books with steampunk! Thank you for introducing me to this author and her books. This is such a beauitful cover and I am really looking forward to reading this.